Angina (also called angina pectoris) refers to the symptoms caused by ischemia of a portion of the heart muscle — that is, when the heart muscle is not receiving enough oxygen, usually because of coronary artery disease (CAD). The most common symptom seen with angina is chest pain or chest discomfort, but angina can produce several other symptoms as well. Doctors talk about two different kinds of angina, stable and unstable angina. Unstable angina is considered a medical emergency, and you can read more about unstable angina here. In this article we will be talking about the more common form of angina — stable angina. Coronary artery disease often causes blockages in the coronary arteries, which can restrict the flow of blood to the heart muscle. When the heart muscle is not receiving enough blood flow symptoms may result, and these symptoms are called angina. Stable angina is caused by a stable blockage in a coronary artery. The blockage is considered “stable” because it generally stays the same (or gets worse only gradually). For this reason, the angina it produces also stays roughly the same. Angina symptoms tend to occur after about the same amount of exertion or stress, in a generally predictable manner. In other words, the angina displays a reasonably stable pattern of occurrence; hence, stable angina. Stable angina is caused by a stable blockage in a coronary artery. Angina symptoms tend to occur after about the same amount of exertion or stress, in a generally predictable manner. People with stable angina usually have no symptoms at all while they are at rest or during mild activity, since the blood flow to their heart muscle is adequate under these conditions. Angina typically occurs with exertion, and often in a way that is fairly reproducible and predictable. For instance, a person with stable angina may notice symptoms only when climbing a second flight of stairs, or after walking more than three blocks. Or, they may have discomfort localized to the back, abdomen, shoulders, or either or both arms. Furthermore, they may not have any real pain or discomfort at all, and nausea, breathlessness, or “heartburn” may be their only symptom. Again, in a person with stable angina these symptoms generally occur during periods of exertion or stress, and they tend to be reproducible. It is important to realize that the significance of angina has little to do with whether or not the symptoms are severe or tolerable. Angina is significant because it indicates that the heart muscle is not getting enough oxygen, and the heart is therefore at risk. So even “mild” symptoms caused by angina have major significance. This means that any symptoms that might represent angina should never be ignored, particularly in a person who is middle-aged or older, and especially if they have one or more risk factors for coronary artery disease. If you have any unusual symptoms, located anywhere above your waist, that repeatedly occur with exertion or stress, it is important to be evaluated by a doctor. Stable angina is caused by an atherosclerotic plaque that has developed in a coronary artery, and has produced a partial, fixed blockage of the artery. This partial blockage usually permits adequate blood flow to the heart muscle during periods of rest, so at rest there is no angina. However, the partial blockage also limits the maximum amount of blood the artery is able to provide. So, at times when the heart muscle needs to work harder, such as during physical exertion or emotional stress, the blood flow cannot increase sufficiently to meet the increased demands on the heart muscle. The oxygen-starved muscle becomes ischemic, and angina occurs. 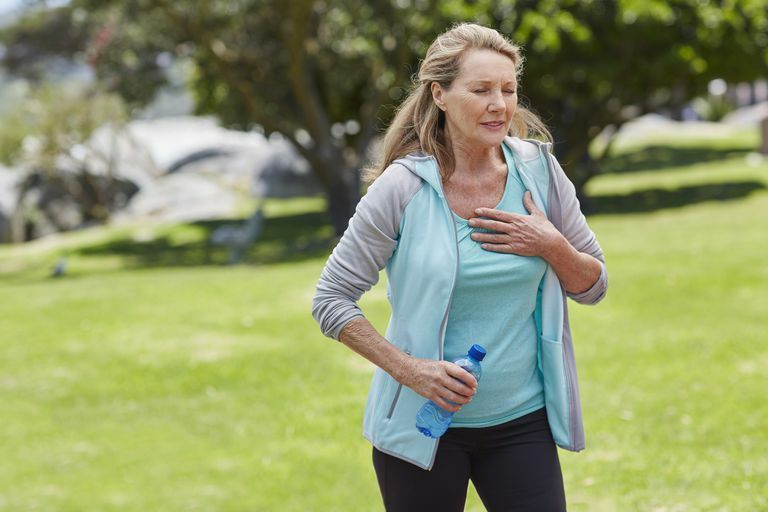 Once physical exertion is stopped — likely because symptoms of angina cause the victim to stop — the oxygen needed by the heart muscle drops down to its baseline level. Within a few minutes, the ischemia resolves and the angina goes away. Doctors generally become suspicious about the possibility of stable angina when a patient describes any recurring pain, discomfort, or unusual feelings originating anywhere above the waist that are associated with exertion or stress. Once a doctor suspects that a person has angina due to coronary artery disease, the next step is usually to order a stress test, most often with cardiac imaging using thallium or Cardiolyte. This testing is usually very successful in detecting a coronary artery blockage that is large enough to produce cardiac ischemia during exercise. Because stable angina tends to be reproducible, doctors can often use a stress test to make a rough estimate of the degree of blockage being produced by the culprit plaque. For instance, angina that occurs after 30 seconds on a treadmill is likely to be caused by a plaque that is producing a lot of obstruction. If the angina only occurs after 10 minutes, the degree of blockage is likely to be much less severe. If the stress test suggests critical obstruction of a coronary artery, a cardiac catheterization may be recommended to actually visualize the coronary arteries. Similarly, serial stress testing can be used to judge the adequacy of treatment, and to give the patient some idea of how much exertion they can perform without cardiac ischemia. The goal in treating stable angina is threefold: to relieve or reduce the symptoms of angina, to try to prevent the further progression of atherosclerotic plaques, and to try to prevent the more severe consequences of CAD — namely, myocardial infarction, heart failure, and death. You can read in detail about treating stable angina here. In summary, treatment consists of medication, of considering whether invasive treatment is needed, and of lifestyle modification to prevent further progression of CAD. Medical treatment may consist of one or more of several drugs that can reduce angina episodes. These drugs include nitrates, beta blockers, calcium channel blockers, and/or ranolazine (Ranexa). In a person with stable angina, invasive treatment (with a stent or bypass surgery) should generally be considered only when medical therapy has failed to adequately control symptoms without causing intolerable side effects. Anyone who has already developed CAD should begin an aggressive program of lifestyle modifications and medications that can slow the progression of this disease. Risk factors that accelerate CAD and that can be treated or controlled include hypertension, diabetes or metabolic syndrome, abnormal blood lipids, being overweight, being sedentary, and smoking. Your doctor’s primary goal in treating your angina is to get rid of it — to get you on the right medications and to recommend the right lifestyle changes to eliminate it from your life altogether. In fact, if you continue having angina despite such measures, your doctor is likely to discuss with you the possibility of getting a stent. It may take some time and some trial-and-error, but that’s the goal — to eliminate your angina. The number one goal in treating your angina is to get rid of it. Achieving this goal will take effort, both from your doctor, and from you. The reason this is the goal is not (only) because anginal symptoms are unpleasant. It is because of what angina means. Having angina means that, at that particular moment, your heart muscle is ischemic, and is therefore in danger. Achieving this goal will take some effort on your part. You will need to be careful about taking all your medications as prescribed, and contacting your doctor right away if you are having trouble doing that. You will need to pay attention to your symptoms of angina, and keep a careful record of whether and when you have angina, what you were doing when it began, and how long it lasted. You will need to learn what kind of physical exertion causes angina in your case, and then avoid doing that. While nobody can elimninate all emotional stress, you should avoid situations that you know ahead of time are likely to cause it. If eating a large meal tends to cause angina, then you should eat smaller, more frequent meals. You should talk to your doctor about what, specifically, you should do when you experience an episode of angina — when to take nitroglycerin, how many to take, and how long to wait before calling 911. In most people, the goal of getting rid of angina is achievable, but it takes teamwork between you and your doctor. Stable angina occurs when an atherosclerotic plaque is producing a significant amount of blockage in a coronary artery, sufficient to cause cardiac ischemia when the heart is being stressed. It is important for stable angina to be diagnosed and treated in order to avoid permanent cardiac damage, or worse. Anyone who has symptoms of chest discomfort with exertion — or really, any other unusual symptoms above the waist that recur with exercise or stress — should be evaluated by a doctor. Fihn SD, Gardin JM, Abrams J, et al. 2012 ACCF/AHA/ACP/AATS/PCNA/SCAI/STS Guideline For The Diagnosis And Management Of Patients With Stable Ischemic Heart Disease: Executive Summary: A Report Of The American College Of Cardiology Foundation/American Heart Association Task Force On Practice Guidelines, and the American College of Physicians, American Association for Thoracic Surgery, Preventive Cardiovascular Nurses Association, Society for Cardiovascular Angiography and Interventions, and Society of Thoracic Surgeons. Circulation 2012; 126:3097.